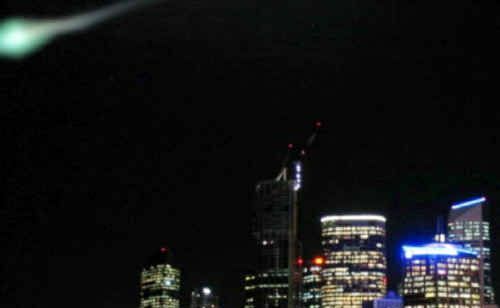 FIREBALL: This green fireball over Brisbane CBD was one of several shooting through the region, resulting in hundreds of UFO sightings. 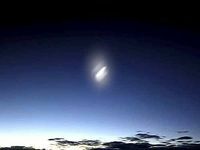 A FLOOD of UFO sightings over Northern NSW and South-East Queensland in 2006 may have been solved by an Australian scientist. 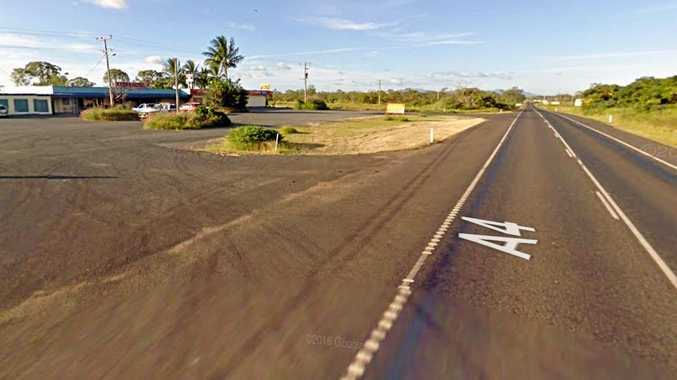 Hundreds of people witnessed the spectacular display of brilliant, green, fragmenting fireballs tracing across the sky from as far south as Ballina and as far north as Gladstone in Queensland shortly after 6pm on May 16, 2006. Dr Stephen Hughes, a physics researcher and self-described sky sleuth from the Queensland University of Technology, believes he has unravelled the mystery after collating more than 200 reported sightings – many with mobile phone photos – from a public survey he conducted. In an article published in British science journal, Proceedings of the Royal Society A, on Wednesday, Dr Hughes proposed that the phenomenon was the result of meteor fragments accompanied by extremely rare ball lightning. 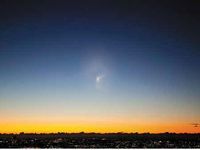 “It was also apparent that at least three fireballs had blazed across the sky at about the same time – one travelling north up the coast, another roughly east to west across Brisbane, and another south over the Gold Coast,” he said. “Fireballs can produce ionised trails which, in principle, are able to conduct electricity between 80km to 20km from the Earth. It is possible that they could generate a conductive trail all the way to the Earth that would be invisible until it hit the ground, where it would produce a ball-like shape as the current flowed back from the ground. Dr Hughes said the green lights were also seen off the coast of New Zealand an hour before the local sightings. He believes they were fragments of a comet that was passing close to the Earth and the rocks, weighing at least one kilogram each, glowed green due to oxygen atoms being ionised by its speed. The strangest sighting, from Don Vernon, of Greenmount, was of a ‘strange, green, glowing ball’ about 30cm in diameter seen ‘gently rolling down the slopes of the Great Dividing Range’ soon after the fireball’s passing. Dr Hughes visited Mr Vernon and found nothing unusual. “I think the ball lightning phenomenon Mr Vernon saw was caused by a transient electrical connection between the ionosphere and the ground,” he said.